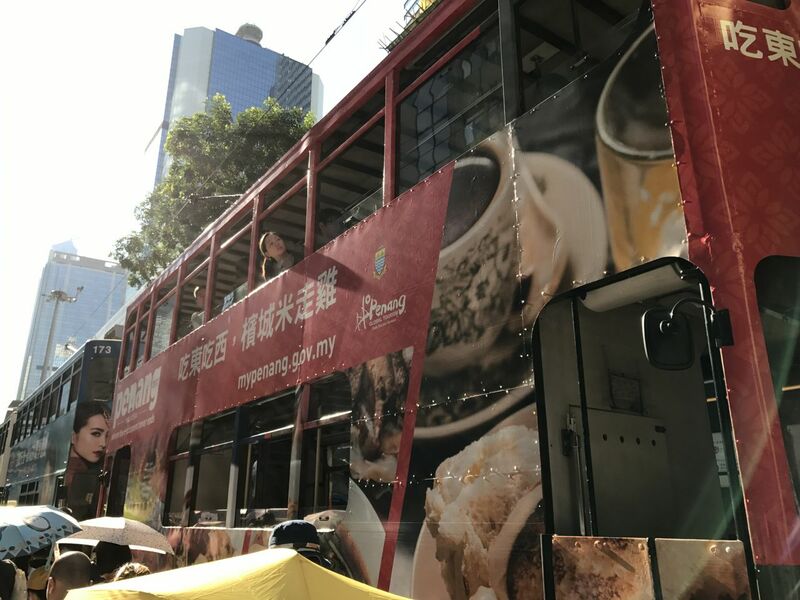 It turns out there weren't only a few people outraged about the jailing of the three Occupy leaders, Joshua Wong Chi-fung Nathan Law Kwun-chung and Alex Chow Yong-kang -- there were tens of thousands of them. Police estimated there were about 22,000 people who started the march at Southern Playground in Wan Chai -- which probably means there were many, many more people willing to be outside in the hot sun, pouring with sweat. We were stuck on Luard Road for an hour -- in the shade! 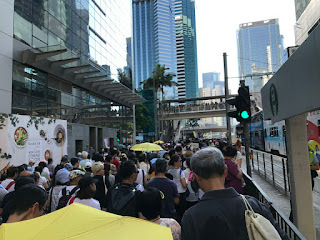 I took the MTR from Admiralty to Wan Chai and there were so many people getting on the train that I knew already that lots of protesters would show up. 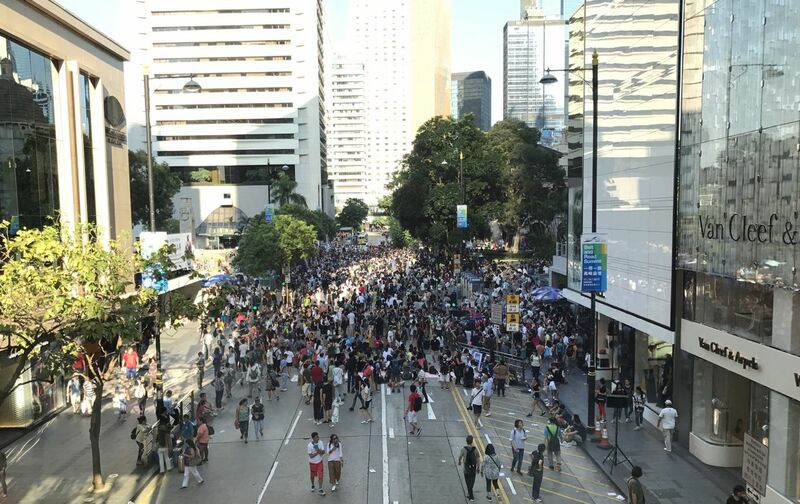 That was the biggest concern of my friend YTSL who worried that only a few people would show up like on July 1. One would think the 20th anniversary of the handover would be enough to spur people to get out into the streets, but it was this hot button issue of jailing what the foreign media are calling "Hong Kong's first prisoners of conscience" that got people out. YTSL and I managed to find each other and then headed out the to the Johnston Road exit where it seemed everyone else was heading, but after we got out of Southern Playground, we barely moved for an hour. 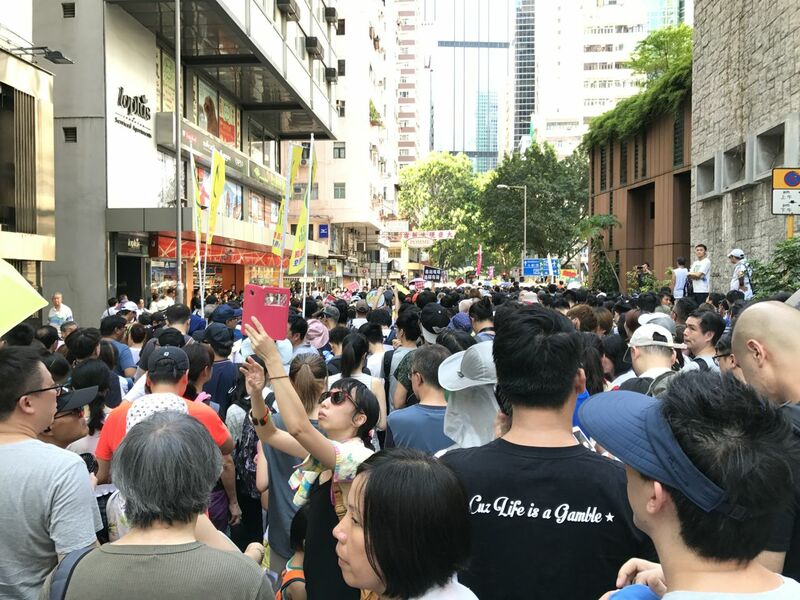 We speculate the police underestimated how many people would show up and so the march was halted from starting in order to get enough manpower to close the streets and stand along the march path. Or they were trying to make protesters annoyed enough that they would leave before it began. A few elderly people did -- it really was quite hot -- but other than that the rest of us stayed put and shouted "hoi lo!" or "let us march!" At around 4.15pm we finally made our way up Luard Road and then turned left onto Hennessy Road. A few people tried to pump up the crowd with slogans, but for the most part we just wanted to show our presence. One elderly protester seemed keen to pick fights with anyone, police officers in particular with verbal slurs, but his friends dragged him away or told him to calm down. We're just here to march, mister! No need to start a fight! It was kind of bizarre how we had to wait for an hour at the starting point, but it took less than an hour to march to Central. When we got to the end, volunteers were soliciting donations for the three pro-democracy groups that organized the march: League of Social Democrats, Demosisto and Civil Human Rights Front. They asked for a minimum of HK$10 but I saw several people put HK$100 and even HK$500 bills in the boxes. We didn't stay behind for the rally, as there were thousands of people behind us who had yet to arrive, but we were just pleased to voice our opinion with our feet!